But Tyson said the likelihood of that happening were low. “A sufficiently intelligent civilisation would have positively no interest in us at all,” he said. “In the same way as when you’re walking down a street and there’s a worm there.”. And even if you wanted to kill all the worms, he continued, you’d soon get bored and do something else. 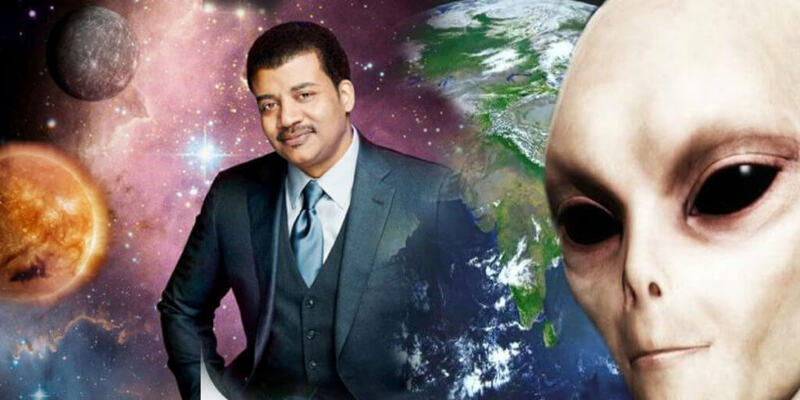 Tyson also argued the tiny genetic difference between a human and a chimp made it likely alien intelligence, if it does exist, is already way beyond our on. “We would not be able to comprehend their simplest of thoughts any more than a chimp can understand ‘Let’s go have dinner at the buffet later I’m going to have some carbohydrates and protein because I’m on a low fat diet’. What would that sentence mean to a chimp?” he joked. To a hyper-intelligent alien race, Tyson continued, Stephen Hawking’s intelligence might be the equivalent of an alien toddler. He also had a word of warning for those that would have humanity become an interplanetary species. “Yes, being a multi-planet species I think that looks good on paper. Put your eggs in more than one basket. If one basket gets smashed the species is preserved. In practice it is completely unrealistic. Let’s terraform Mars, turn Mars into an Earth-haven, ship four billion people there,” he said. “Now, forty years later, we have photo-realistic, 3D simulations with millions of people playing simultaneously and it’s getting better every year. Soon we’ll have virtual reality, augmented reality,” said Musk.